The first major hurdle for most millennials is achieving a credit score high enough to qualify for a reasonable loan. Some first-time buyers are unaware of the huge impact that their credit score will have on their loan interest rate. Millennials should be laser-focused on getting their credit score up above 725 if they want a competitive rate that won’t break the bank. This can be done most effectively by paying down student loans in advance and getting a handle on any unsecured credit card debt on their report. Thanks to the gig economy and the vast opportunities for online self-employment, fewer and fewer millennials are receiving traditional W2s at the end of the year. This poses a major problem for mortgage lenders who demand at least 2 full years of W2s in a stable job, or more than 3 years of independent contracting income. Even worse is that tax deductions for self-employment expenses count against your total income, so you may have to give up some deductions to keep your income up for the year before you buy. Millennials need to keep very concise records of their earnings from all sources if they hope to pass the income verification test. Aside from income and credit scores, the final test comes down to the down payment and closing costs. Millennials will do well to research local down payment assistance programs which often offer up to $5000 towards closing costs for taking a responsible mortgage borrower’s class. Otherwise, FHA and VA loans offer low upfront costs for buyers but can cost more over the long term. Buyers who have more money in the bank will have more lending options and a better chance of getting approved. 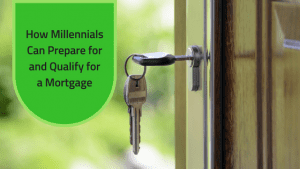 These are the three main areas where millennials need to be preparing themselves well in advance if they want to take out a mortgage loan. These are also areas that impact millennials differently than other generations because of the way millennials earn money and carry debt today. To learn more about your options as you prepare for your first mortgage, contact us today and we’ll be sure to help you out.